1972 Arsenal reach their 5th Cup Final in 5 years, only to have their hopes dashed. After the glory of the 1970-71 season, 72 can only be described as a huge disappointment. In any walk of life achieving success is only half the battle. Living with the difficulties it can create is another matter altogether. A month after the "Double" was won, North London was alive with rumours of the first split in the camp which had seemed to be rock solid. Done Howe, who had proven so influential in his capacity as coach during the previous season left for West Bromwich Albion on July 8th 1972 . John Sammels also moved on to Leicester City for £100,000. These moves combined with inconsistent performances from Simpson, George and Storey resulted in Arsenal only finishing fifth in the league. 1976 Terry Neill brought in to replace Berty Mee at the reigns. In the mid season between 1975-6 and 1976-7 season Bert Mee resigned and after huge speculation (I must admit that even I applied for the position of Arsenal Manager and received an official reply from the club firstly telling me that they had received my application for the position, and then that unfortunately I was deemed unsuitable!? )Terry Neill was appointed as Arsenal Manager. His first task was to lure the near legendary Malcolm "Supermac" Macdonald from Newcastle United for £333,333.33. Macdonald joined a team including Pat Rice, David O'Leary, Liam "Chippy" Brady and Frank Stapleton and Graham Rix. Neill turned the team around, and in his first season Arsenal finished 8th with Macdonald scoring 25 goals. 1978 Ipswich Town spoil Arsenal's revival. Terry Neill's second season in charge included the additions of Pat Jennings (A huge coup after Tottenham (scum) thought the 32 year old Northern Ireland International was ready for retirement and sold him for a mere £40,000. Jennings in fact went on to play over 300 games for Arsenal! ), Willie Young, Alan Hudson and Alan Sunderland producing a team with huge potential. Neill's second season saw Arsenal climb to fifth position in the league and ended with another visit to Wembley. Arsenal were instilled as firm favourites for the game, and this should have been an indication of what was to come. Arsenal have always excelled in conditions of adversity, May 6th 1978 was not one of those occasions. A solitary goal by Roger Osborne (never heard of before or since) was the lowest point of a forgettable game. Arsenal's official excuse was their toll of injuries. Alan Sunderland was recovering from a broken bone in his foot and wasn't match fit, Rice, Nelson and Young were carrying knocks, Macdonald had been told he needed a knee operation on his right knee and lacked mobility and Brady had a shocker! There were more excuses, but I will save them for the 1980 Cup Final.... The only saving grace was Terry Neill's parting promise that Arsenal would be back next year. Macdonald unfortunately had a knee operation three days after the Cup final, it was unsuccessful and a series of operations followed that ended his career at the age of only 29. He had visited Wembley on three occasions (twice with Newcastle) and had three losers medals to show for his efforts. As an aside, Season 1977-78 included a game against Walsall in the 5th round of the F.A. Cup at Highbury on the 18th February 1978. Arsenal won 4-1 with goals from Stapleton (2), Macdonald and Sunderland. It was the first Arsenal game that I went to. It may not mean much to you, but it sure does to me!! 1979 Arsenal Crush Manchester United in the F.A. Cup Final of the Century! The 1978-79 season will remain in EVERY Arsenal supporters memory for one game. It was unforgettable, one of the goals is still shown on television to this day. The date was 23rd December 1978, the venue was White Hart Lane, the opposition was "The Mighty Tottenham Hotspur" and the result was Tottenham 0 (zero, nothing, nought, nada!) ARSENAL 5 with Alan Sunderland scoring a hat-trick, Frank Stapleton scoring from an exquisite cross from Brady and Brady himself added to the tally with a sizzling curling wicked searing thunderbolt from the edge of the area!! The season will also be remembered for our epic F.A. Cup battle against Sheffield Wednesday in the third round, and a Final victory against Manchester United that had people engrosed to the point of becoming numb in an epic five minute climax. The Winter of 1978-9 was bitterly cold and Arsenal were one of very few clubs to continue to play due to their under soil heating system. In the third round of the F.A. Cup Arsenal were drawn against third division Sheffield Wednesday. Arsenal were held to a 1-1 draw at Hillsborough in the first game, while roles reversed for the replay and Arsenal came from behind with a Brady goal salvaging a draw. For the second replay a neutral ground had to be chosen. As half the country was completely frozen, Filbert Street, Leicester was chosen as the venue. Filbert Street while without undersoil heating had a huge hot air balloon that rested the full length and breadth of the pitch to protect it from frost and snow. The game produced a 2-2 draw on a bitterly cold Tuesday night. The teams returned two days later for a bitterly cold Thursday night and played out a thrilling 3-3 draw. Five days later the teams met for a fifth time. This time however, first half goals by Frank Stapleton and Steve Gatting finally ended the bold resistance of the third division team. In all, a total of 143,996 fans plus television audiences had been enthralled by 540 minutes of classic cup action. Remarkably, Arsenal had also played a single first division game during all the replays and had enough strength to win it 2-1 (the opponents were Nottingham Forest, and our scorers were Stapleton and Price). Arsenal made light work of the following round with a 2-0 victory against Notts County, the 5th round however produced a one sided torrent of action. On a hot and stifling day, with Brian Talbot running his heart out in midfield, and Brady and Stapleton looking like world class players, the cup looked won with joint effort from Sunderland and Talbot - they arrived at the same time for a shot though the goal was later given to Talbot (probably only because Sunderlands name was by then certainly on the score sheet...) - and Stapleton's fine header. But with five minutes left the game was transformed by scrappy goals by McQueen and McIlroy for Manchester united. When Brady took the ball deep into United's half from the second kick-off, his only thought was to keep possession and hope for extra time, so fired up were United. But Graham Rix had summoned up the energy for a marvellous run, took Brady's pass and slung over a perfect cross to the far post for Alan Sunderland to slide the ball in for the winner ("There's a minute left on the clock, Brady for Arsenal.......right across, Sundeland...It's there, I do not believe it, I swear I do not believe it!"). There was no time for United to come back again. Arsenal had done it. Once again, they had given themselves a mountain to climb, and achieved glory. The victory meant that Brian Talbot had become only the second player in F.A. Cup history to win back to back winners medals with different clubs. 1980 Success brings 70 games in a season and ultimately failure......! 1979-80 started for Arsenal with an omen, a comprehensive 1-3 defeat by Liverpool in the Charity shield. Little did we know at the time, that Arsenal would progress by the seasons end to a record third successive F.A. Cup Final, a European Cup Winners Cup Final, the quarter finals of the Football League Cup and a U.E.F.A. Cup place for the following season if they won their last game. Potentially, the 79-80 season was as good as things get.! The strain however of playing 70 games in less than 9 months took it's huge toll. The team had a solidity about it that produced 16 drawn games in the league. The striking partnership of Frank Stapleton and Alan Sunderland produced 28 goals equally shared, it was a good partnership, but not earth-shattering. Only once during the whole League season did Arsenal manage to score more than three goals, and that Ironically was on the opening day of the season away to Brighton and Hove Albion (Sunderland 2, Stapleton, Brady). The cups however were another matter. Leeds United were crushed 7-0 in a second round League Cup replay at Highbury (Sunderland 3, Brady 2, Stapleton, Nelson) and Brighton were once again dealt a 4-0 drubbing in the 4th round of the same competition (Stapleton 2, Vaessen 2). In the Cup Winners Cup IFK Gothenburg were going to have to climb a mountain if they were to progress to the Semi-Finals after Arsenal beat them 5-1 in the first leg of the Quarters' (Sunderland 2, Brady, Price, Young). Two games however will be etched in the momories of Arsenal Supporters for the huge disappointments that they fill us with. Before I get onto those though I will tell you about the seasons two highlights. The first was the F.A. Cup Semi-Final against Liverpool (defending League Champions, team of the 70's and by that time, well on their way to another Championship). The Semi-Final was an epic that took four games, a titanic struggle, and the prophetic blood sweat and tears to win. 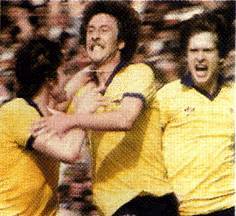 The third game produced a goal for Arsenal in just 13 seconds by Alan Sunderland (the fastest ever Semi-Final Goal). The battle of the titans was finally settled with the third replay at Highfield Road when Talbot scored a lone goal early in the first half. The four games (longest ever F.A. Cup Semi-Final) had amassed a total of 169,163 supporters and Arsenal had proven that they were more than a match for anyone on their day. The second highlight was in the Semi-Finals of the European Cup Winners Cup. Arsenal were drawn against Mighty Juventus. The first game at Highbury produced a thrilling 1-1 draw (Juventus scored an own-goal). This meant that we had to visit Turin knowing that only a win or a higher scoring draw would see us through to the final. The task for Arsenal was monumental. In 25 years of European Competition Juventus had never been beaten by a British club on home soil for the previous ten, they hadn't been beaten by any European club either. With just two minutes of the game remaining Arsenal were facing an exit from the competition on the Away goals rule when Paul Vaessen popped up at the far post to score the historic winner. Paul had come on as replacement for Price. It was a goal that silenced a stadium and put Arsenal into their final with Valencia. Unfortunately, it was also the highlight of a short career for Vaessen as he would have his career cut short by a serious knee injury within two years of that game at the age of 20! The F.A. Cup Final against unfancied second division West Ham turned out to be another one of those days when Arsenal really should have stayed in bed. Finals against lower division clubs seem to be a constant thorn in Arsenal's side. A single goal by Trevor Brooking (probably his first ever header, but apparently according to Brooking his third) saw the Cup go to East London rather than North London. The only high point of the game was when Willie Young with only 3 minutes to go cut down Paul Allen blatantly as he was looking good to score. It was a cruel, crude tackle which was clearly meant not to stop the progress of the ball, but to make sure Allan didn't score, infact, it showed all the frustration that every Arsenal supporter felt on the day. The European Cup Winners Cup Final was a completely different story to the F.A. Cup Final. Arsenal played well during a scoreless 120 minutes. They never looked second best to Valencia, and frankly should have won the game in normal time. Both defences however held out, as the minutes ticked their way towards a penalty shoot-out. Both Mario Kempes and Liam Brady failed to score from their respective spot kicks. from then on, both teams scored. With the penalty score at 4-5 up stepped Arsenal's sixth penalty taken Graham Rix. Goalkeeper Carlos Pereira had been moving before the penalty taker kicked through all the previous kicks, and did so again. The ground came to a moment of silence as Rix stepped up and tried to place a weak shot. Pereira guessed correctly and dived to his left saving the shot. The crowd roared as the television cameras focused in on a crushed and dishevelled Graham Rix as tears filled his eyes and he realized the enormity of his error. The season was not over yet for Arsenal though. They still had two league games to go. If they won them both they would at least qualify for a UEFA Cup place for the next season. Three days later they travelled to Wolverhampton and somehow came away with a 2-1 victory (Stapleton, Walford). They had no time to rest though because the following Monday night (19th May 1980) saw them play their 17th game from the beginning of April including three where extra time was needed. Unfortunately the Gunners ran out of steam as Middlesborough ran out 5-0 winners scoring more in one game than Liverpool, West Ham and Valencia had in six. Arsenal finished up with nothing when the potential was there for their best ever season. 1981 The Arsenal exodus begins! After the shattering disappointment of the 1979-80 season a period of apathy seemed to descend upon Highbury. Frank Stapleton and Liam Brady moved on to Manchester United and Juventus respectively. Hawley, Chapman and Hankin moved in (none was an adequate replacement for any of the players we already had) Kenny Sansson seemed to be the only purchase of any value, and he came to Arsenal in what seemed like mysterious circumstance. Clive Allen was bought for a record £1,250,000 during the 80-81 off season, and without playing a single competitive game for the Gunners eight weeks later a deal seemed to be struck for a swap (with Paul Barron thrown in) for Crystal Palace's talented left back. Arsenal did manage to end the season in 3rd place, but attendances dropped off and all seemed bleak. 1982 Denis Hill-Wood passes away. Arsenal Chairman Denis Hill-Wood, much beloved and respected throughout the game died aged 76. Denis was the backbone of Arsenal for so many years. He had taken over as Arsenal Chairman from his father 22 years earlier and had continued a long family tradition when the Chairmanship passed on to his son Peter. The first half of the 1980's will not be remembered for it's cup victories but for cup defeats. For a time there seemed a steady stream of embarrassing reverses; to Second Division Middlesborough in the F.A. Cup in 1984, to Fourth Division York City a year later (0-1 after Steve Williams gave away a last minute penalty with an "Off-the-ball foul! "), to Second Division Oxford City in the Milk Cup and, above all others, 1-2 at home to Walsall in the Milk Cup on November 29th 1983. The Walsall defeat was probably the final nail in Neill's already assembled coffin. Arsenal were by no means bad in the First Division, they were just "also-rans". They could finish fifth or sixth quite easily, but had no chance of the Championship. Neil at one point was prompted to say, "They (the players) don't seem to know what it is to hunger for goals and glory. On days like today (0-3 defeat at Leicester City) I think they just want to pick up their money and go home. But I'll tell you now; well finish in the top six again this season. Whether or not I'll be around to see it is another matter!" They did finish sixth, and Neill was not around to see it.. A combination of the Walsall defeat, and ones by West Bromwich Albion and West Ham resulted in Peter Hill-Wood dropping the Axe. A club that had in the previous 60 years had only eleven managers (two of these, Chapman and Whittaker had died in office). Don Howe was appointed as his replacement. 1986 George Graham Takes over the hot seat and a new era begins. Howe's problems were much the same as those of Terry Neill's - he couldn't quite crack the goalscoring problem. On the 22nd March 1986, after Arsenal had beaten Coventry City 3-0 and despite it being a fourth consecutive League win, Don Howe asked to be released from his contract. He had heard on the "rumour-mill" that Arsenal were considering signing Terry Venables if he were to be released from his Barcelona contract..
History if course tells us that Terry Venables did not become Arsenal Manager, that roll was filled by none other that the 1970-71 F.A. Cup Final Man-of-the-Match George "stroller" Graham. Graham proved to be just the right man for the job at the right time. Graham did not spend any money straight away in establishing his own squad of players. He settled on building from the back.. The last line of defence included Anderson, Sansom, Adams and O'Leary, all International regulars. On the 27th of September 1986 Arsenal lost to Nottingham Forest 1-0, defeat was not to be an issue again until 24th January 1987. 22 games unbeaten, a new Arsenal record. During that period they won 17 and drew 5 games scoring 47 goals and conceding only 11. 1986 Our Centenary year brings Arsenal a First League Cup triumph. 1986-87 will always be famous for three things, the first was the signing of George Graham, the second was the Centenary, the third was the saying, "one-nil down, two-one up, that's how Arsenal won the Cup, la la la la la la la la la!" The nicest thing about this is that it happened on three occasions in our Littlewoods Cup (renamed from the League Cup due to sponsorship reasons, it had been known for the previous four seasons as the Milk Cup.) winning run. The Semi-Final against long time rivals Tottenham Hotspur proved to be a demonstration of resilience and the difference between the Arsenal's of both Neill and Howe and the New Arsenal the Graham was creating. They had a "never-say-die" attitude. Graham instilled the somewhat new belief that the game should be played for the full 90 minutes with equal gusto. The first leg of the Semi-Final was at home to Tottenham. Tottenham went away 1-0 victors with a goal by Clive "we didn't want him" Allen. The second leg at White Hart Lane looked to be going the same way when after 38 minutes Clive Allen once again popped up to put Arsenal 0-2 behind on aggregate. The second half of the second leg of the Littlewoods Cup Semi-Final was not only a peek at the NEW Arsenal, but the birth of a new era of success for the Gunners. Arsenal came out for the second half and Viv Anderson brought a well needed equalizer on the night. There was a new vibrancy about Arsenal as the continued to push forward. With time at an essence, Niall Quinn met a David Rocastle cross at the left hand post quite beautifully to make the score 2-1 forcing a third game (away goals were not recognised in the Littlewoods Cup). The referee tossed a coin at the end of the game for home advantage in the third tie, and incredibly it stuck upright in the mud.... Tottenham won the second toss, and it Arsenal were once again White Hart Lane bound. The third game was once again a nerve wracking affair. For the third time Tottenham took the lead with Clive Allen scoring their goal. This time, Spurs held on for 82 minutes before they were pegged back by an Ian Allinson goal. Then, with only moments remaining Arsenal pushed three men forward and reaped the rewards as David Rocastle squeezed a shot underneath Ray Clemence's body silencing the Spurs supporters and sending the Arsenal ones into ecstasy. Gee, White Hart Lane can be a fun place! 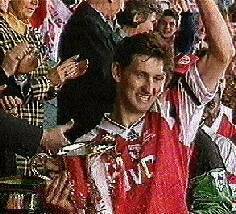 Liverpool were installed as overwhelming favourites for the Littlewoods Cup Final played on the 5th April 1987, but once again, they were to be "bridesmaids" as Arsenal lifted their first League Cup. Destiny seemed to lend a hand in the 23rd minute when Ian Rush scored for Liverpool. In his long career with the reds, they had never lost when he had scored (almost 150 games). This Arsenal side however were undaunted. On the stroke of half-time Charlie Nicholas poked a goalmouth scramble home and Arsenal were level. Late goals seemed to be the flavour of the day, because 7 minutes from the end of full-time Perry Groves roared in from the left, depositing defenders behind him and pushed the ball to Nicholas. The "golden boy" shot rather weakly, but the ball took a peculiar spinning deflection that left Grobbelaar stranded as it meandered into the net. George Graham said afterwards: "We have often played better; but the prize at the end made it one of Arsenal's most memorable performances. It makes a dream start for me, but this is just the start." This history was written by Steve Gleiber. Frankly, I spent weeks reading Arsenal history books, watching Arsenal videos and listening to Arsenal tapes to bring this to you, so I'm adding my little © symbol to it ok! Please do not copy, distribute or reproduce this history without my permission.